It seems that over the last three days, rainy cool weather has made the leaves start to turn and fall. I couldn't resist snapping a few gratuitous nature shots as I walked Lucy this morning. 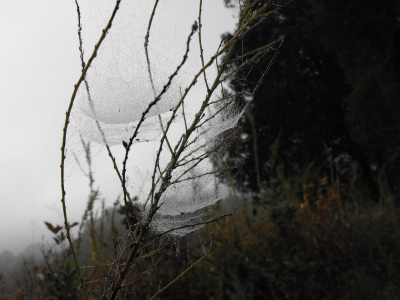 I've always loved the cup-shaped spiderwebs which show up at this time of year at the edges of fields, especially when they fill with dew and turn into sparkling white nets in the grass. 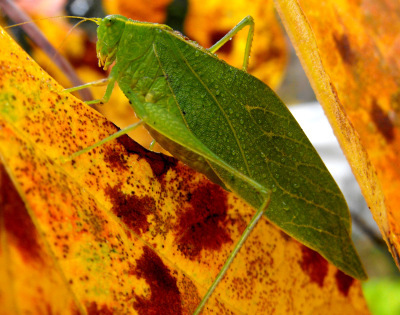 I also caught a dew-covered katydid perched on a brilliant sassafras leaf. Although friends nearby had a frost last week, we never dropped below 33 F, and the crickets and katydids started calling again when the nights warmed up.